Yes, summer is barbecue season… but that doesn’t mean your vegetarian friends should go hungry. Grilling brings out the natural sweetness in summer produce. As part of our new Summer Eats Series, we’ll be back here soon with tips and tricks for your favorite grilled proteins… But we thought we’d serve our oft neglected plant friends first. Get those coals hot, herbivores! Do steam or blanche heartier vegetables, like beets, carrots, parsnips, potatoes, winter squash and artichokes, until just barely tender to reduce grilling time and ensure even cooking throughout. 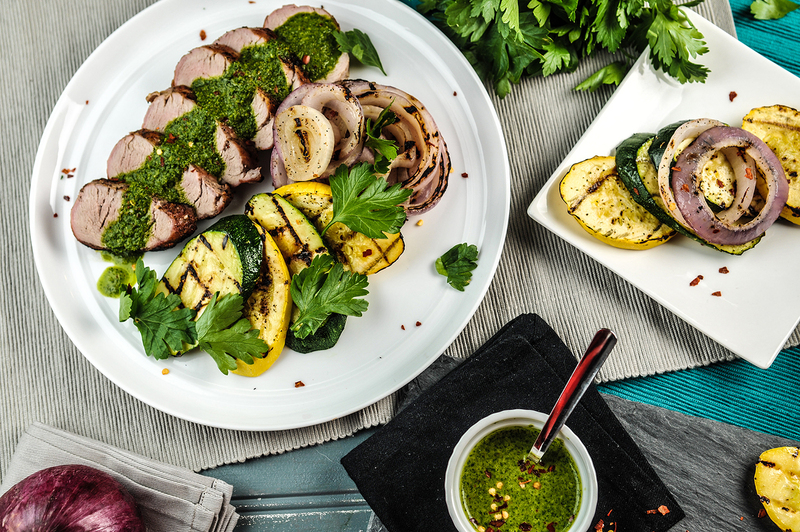 Do place more delicate veggies, like mushrooms, peppers, summer squash, tomatoes, eggplant, fennel, asparagus, green beans and onions, on the grill while still raw. Do grill fruits that are barely ripe, a little acidic, and still firm to the touch when sliced. Pineapple, stone fruits, apples and melon are good bets. Do soak your sliced fruit in a little something boozy before grilling — it’s summer, right?! A drizzle of pure maple syrup will further enhance flavor. Do lightly coat produce in oil to prevent sticking, keep seasoning in place, and prevent your fruit and veggies from drying out. Don’t place finely chopped veggies directly on a hot grill. Use a grilling basket, skewer or foil packets brushed with oil to avoid casualties. Don’t peel vegetables before grilling. The skin or husk (summer corn is reason enough to buy a grill, btw) acts as a natural insulator, keeping steam inside and preventing your produce from drying out. Don’t leave your plant feast unattended. Cook produce directly over moderately hot coals, but rotate fruits and veggies to cooler parts of the grill as necessary to ensure that nothing burns. We know it’s tempting to snack directly from the grill, but don’t do it. You and the roof of your mouth will be sorry. Happy summer! Keep an eye on future Home Chef menus for grilling options.